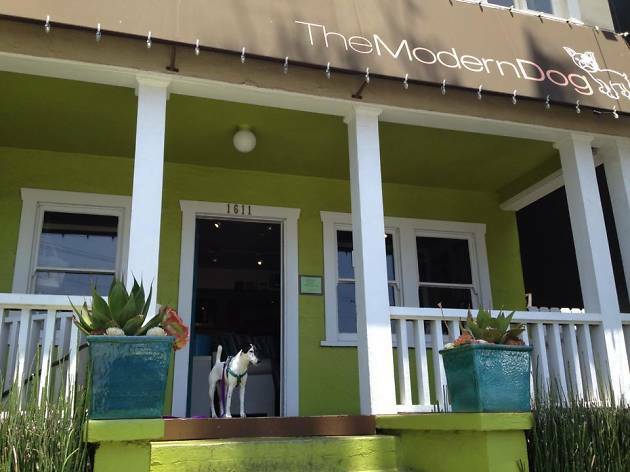 Created and curated by Guy Miracle and Lance Castro and located on Abbot Kinney, the Modern Dog lends itself to the concept of blending pet accessories with your home’s interior style. It’s no accident that the store is occupying a cute and cozy 1920s Craftsman bungalow; all of the rooms have been utilized to provide the perfect environment for shopping. Living and entertaining products are in the living room, beds and sleeping accessories are in the bedroom, gourmet foods and treats are in the kitchen, and there’s much more to see throughout. 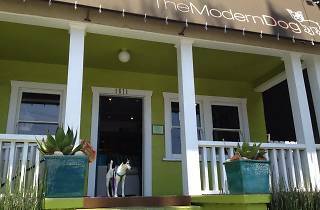 Quality (and many local) brands are featured in the store including Bella Bean Couture, Decaf Plush, Dirty Laundry, Everyday Studio, Holden Bowls, Monkey Daze, Milla, Otis and Claude, Paul Frank, Chrome Bones and Walteria Living. Want to immortalize your pet for posterity? Pet photography, animal blueprints (styled like an architect’s blueprint rendering of your dog), and SilhouPETtes (vintage silhouette images, complete with a customizable background to match any decor) are also part of the Modern Dog experience.